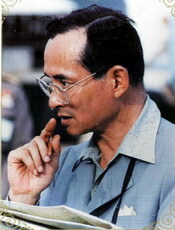 “Chitralada Villa, Dusit Palace,” the royal residence of His Majesty King Bhumibol Adulyadej, the ninth monarch of Thailand’s Royal House of Chakri, is unique in that it is an experimental site for His Majesty’s Royal Chitralada Projects in such fields as agriculture, forestry, and small-scale industries. Rice fields, vegetable beds, groves, livestock enclosures, fish ponds, a rice-mill, and a dairy factory can be seen in the palace grounds. When successful, the results of these experiments will be publicized so that people and organizations can make use of them. Students, farmers, the general public, and even foreign visitors pay regular visits to observe the operation of the projects. Throughout the 60 years since his ascension to the throne, His Majesty has paid regular visits to his subjects in all the regions, especially in remote and impoverished areas. As a result, more than 3,000 royal-initiated projects have been set up since 1952. It can be summarized that the target of the numerous royal-initiated projects is the development of “Man,” to be self-reliant. One of His Majesty’s significant principles is that the development must be suitable to the geographical and social conditions. There must be proper promotion of knowledge and modern technology. 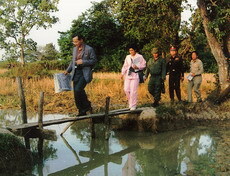 The developments must be based on the principles of sustainable conservation and the development of natural resources. His Majesty’s New Theory proposes guidelines for the proper management of limited natural resources to achieve optimum benefit. It has been estimated that Thai farming households, consisting of 4-5 members each, own approximately 15 rai (24,000 square metres) of land per household. The New Theory thus divides the land into four parts; thirty percent for digging a pond to collect water to be used for cultivation in the dry season, and to raise fish as well; thirty percent for rice cultivation sufficient for all year round home consumption; thirty percent for integrated field and garden crops, and fruits; and ten percent for housing and constructions for other activities such as livestock enclosures, mushroom nursery, and roads. When the New Theory is carried out, in the first year the farmers will have all the food they need for consumption. They are basically self-reliant concerning food and also have work to do all year round. When successful, some farmers will follow the second phase of the New Theory by forming groups to sell their surplus, thereby initiating production, marketing, and social grouping, resulting in a cooperative. This leads to the third phase of the New Theory which involves an expansion of operation to facili tate a higher level of business dealing, requiring funding from outside sources such as banks or private companies to set up funds to carry out activities for further benefit. In developing the country, His Majesty has adhered to the natural principle, in which people employ natural resources available in each locality. 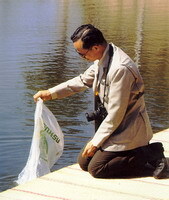 The results are very satisfactory, for example, growing vetiver grass to prevent the erosion of top soil, as well as to conserve soil and water; improving deteriorated soil for natural farming; refores tation without planting; building check dams in the forests to conserve watershed areas; and using water hyacinth to solve the problem of polluted water. The simple operations of these projects have resulted in the balance of the entire ecological system, and led to sustainable development. The Royal Development Study Centres and various other projects have therefore been visited not only by practitioners but also by heads of s tate, prime ministers, as well as leaders of many countries. Eminent visitors include Her Majesty Queen Elizabeth II and Prince Philip, the Duke of Edinburgh, of the United Kingdom, Their Majesties King Carl XVI Gustav and Queen Sylvia of Sweden, His Excellency Nuhak Phumsawan, President of the Lao People’s Democratic Republic, and President Gloria Arroyo of the Republic of the Philippines. In 2005 the Ministry of Foreign Affairs and the Office of the Royal Development Project Board jointly organized the Ministerial Conference on Alternative Development: Sufficiency Economy, attended by 19 ministers from countries in Asia, Africa, and Latin America. As a means to offer sustainable agricultural assistance, His Majesty’s philosophy of Sufficiency Economy and the New Theory for agriculture have been used as guidelines in providing assistance in the reconstruction of Afghanistan. The United Nations agreed that the work of the royal-initiated projects is most suitable in the development of countries in dire need of assistance. The Vetiver Grass Development Projecthas been in operation in Thailand since 1991. 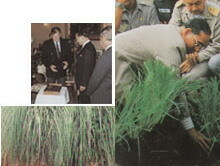 Due to the internationally recognized results of the project, Thailand has organized international seminars on vetiver grass twice, the first in 1996 on “Vetiver: A Miracle Grass,” and the second in 2000 on “Vetiver and the Environment.” The success of the royal-initiated vetiver operation has induced Thailand to organize vetiver training and field trips for foreigners from 15 countries around the world. Moreover, officials from agencies such as the Ministry of Environment and Natural Resources of the Philippines, the Zambian Ministry of Agriculture, Food and Fisheries, and the US Ministry of Agriculture have taken special interest in vetiver operations. Apart from development work for the well-being of his subjects, His Majesty‘s benevolence is also manifested in times of catastrophes. One noted incident was in 1962 when a typhoon struck twelve coastal provinces in Southern Thailand and caused extensive destruction to lives and properties. His Majesty was the first to promptly take action by making a nationwide appeal through his palace radio s tation, the Aw Saw Radio at Ambara Villa, for the relief of the storm’s victims. The amount of money donated was so great that after the relief operation there was enough left over to establish the Rajaprajanugroh Foundation to relieve victims of natural disasters. The 26 December 2004 Indian Ocean tsunami wrought mass destruction in several countries in East Africa, South and Southeast Asia, including six southern provinces of Thailand on the Andaman Coast. 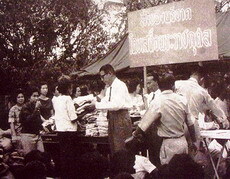 Again it was His Majesty the King who first set the relief operation in motion by donating a large sum of money through the Chaipattana Foundation to alleviate the immediate plights of the tsunami victims, who were provided with food, clothing, medical care, and temporary lodging. The education of thousands of children, orphaned by the tsunami, was of primary concern. The Rajaprajanugroh Foundation gave assistance in the construction of new schools in Krabi and Phang-nga and restoration of the ones in Phuket. The children have been given accommodation and provided with opportunities and funds to pursue their education to the highest level they desire. After the initial stage, with additional donation from several organizations and the public, the Chaipattana Foundation has been able to provide sustainable assistance towards the restoration of the victims and natural resources to normalcy. This has been achieved through the establishment of the “Chaipattana-Thai Red Cross Village 1” and “Chaipattana-Thai Red Cross Village 2” for households in Khura Buri District, Phang-nga Province, the hardest hit area. As villagers in the six Southern coastal provinces, who are mostly fishermen, have lost their boats in the tsunami, the Foundation has provided them with fibreglass fishing boats and set up a boat management fund so that the local fishermen may have a circulating fund for the maintenance of their boats and development of their livelihood.